WASHINGTON (Reuters) - The U.S. Senate Intelligence Committee, known as perhaps Congress' most bipartisan panel, is split along party lines over whether Donald Trump's campaign colluded with Russia in the 2016 U.S. presidential election, sources told Reuters. The inquiries have months to go and much could change, especially with a long-running probe by Special Counsel Robert Mueller not yet completed and many hours of congressional hearings, both open and closed, still to play out. But at the moment, sources said, Intelligence Committee members have been considering the production of dueling final reports, one from the committee's eight Republicans and one from its seven Democrats, reaching different conclusions. Congressional sources familiar with the matter told Reuters that both Republicans and Democrats on Senate Intelligence agreed there was a lack of direct evidence pointing to collusion. The two sides disagree on circumstantial evidence. The Democrats say there is enough circumstantial evidence to support a finding of collusion in the committee's final report. Trump's fellow Republicans on the panel say there is not. "There is no hard evidence of collusion," a Democratic source said, but "plenty of circumstantial evidence." Senate Intelligence oversees America's spy agencies, from the CIA to the intelligence-related functions of the FBI. 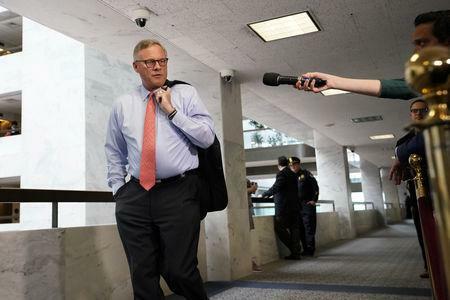 Led by Republican Chairman Richard Burr, the panel's members also include Republicans Marco Rubio and Susan Collins, as well as Democrats Mark Warner, Dianne Feinstein and Ron Wyden. A spokeswoman for Burr declined to comment, as did a spokesman for Wyden, a senior committee Democrat. Burr told CBS last month that the committee, at that time, had found no proof that Trump's campaign colluded with Moscow. Trump denies any collusion occurred and has repeatedly blasted such inquiries as a "witch hunt." If Senate Intelligence, and possibly other committees in Congress, end up producing conflicting reports, Americans looking to Congress for explanations about links between Moscow and the Trump campaign are likely to be disappointed. Moreover, experts said, such an outcome could reduce the odds of an eventual Trump impeachment. Under the Constitution, the impeachment process would begin in the Democratic-led House of Representatives, but it would fall to the Republican-led Senate to decide whether to remove Trump from office. "This may indicate that Republicans don't think there's a smoking gun, nothing that ties the president to a conspiracy," said Elaine Kamarck, a senior fellow in governance studies at the Brookings Institution, a think tank in Washington. "It leaves things with no impeachment, probably. ... If the Republicans are saying: 'Uh uh, this is not impeachable,' then I don't think it's going to happen," she said. Entrusted with some of the most sensitive U.S. secrets, Senate Intelligence began its Trump-Russia probe shortly after Trump took office. It is now moving to re-interview key witnesses, with senators joining staff investigators in the questioning for the first time, the sources said. The committee will assess a January 2017 report from the U.S. spy agencies that found Russia interfered in the 2016 election in various ways. Russia denies any meddling. Also being scrutinized by the panel are the role of social media in the 2016 campaign, the security of U.S. voting systems and steps former President Barack Obama's administration took - or did not take - after initial reports of Russian interference. But the central topic of the committee's probe will be the question of collusion. Bipartisan oversight on those questions is crucial, said Norman Ornstein, a political analyst at the conservative American Enterprise Institute. "If there is a bipartisan report of the Senate Intelligence Committee, assuming it's a full exposition, that would make a difference, even if Burr and Warner had different interpretations," he said. Separate, partisan reports would tell a more familiar story, he said. "Then we're back to the dynamic where Republicans will believe the Burr report, while Democrats, the mainstream media, the intellectual community and the Never-Trumpers are going to believe the Warner report," Ornstein said.